1 Latest date for faster broadband. Latest date for faster broadband. The green "All in One" cabinet is now in place, however the final element of the power work has not been completed yet, with the work scheduled for early January though and the revised date for the cabinet to be live is the 3rd week of January (ie during the week starting Monday 16th January). Note that once the cabinet is enabled, residents are unlikely to suddenly get the highest rates of superfast broadband automatically - they will most likely need to contact their broadband supplier to negotiate a new package that includes this. Stephen Roberts, Hedley Francis and Paul Martin had a private meeting at Shire Hall, Cambridge with the Programme Director of Connecting Cambridgeshire, Noelle Godfrey, and Regional Programme Manager from BT Openreach, Martin Stonebridge. Modelling from BT has shown that trying to service both Carlton and Carlton Green with a single green cabinet would not give Carlton Green the broadband speeds that they should hope for. Therefore they have decided that Carlton Green will be enabled with superfast broadband separately from the rest of Carlton. This will unfortunately means that Carlton Green will have their green cabinet installed around six months after the rest of Carlton, but Carlton Green will likely end up with faster broadband than the rest of Carlton due to its compact nature. The target that BT is aiming for is for as many houses as possible to achieve at least 24Mbit/s. Their proposed location for the all-in-one green cabinet for Carlton is on Carlton Green Road towards the edge of the village. The Councillors pointed out being on the edge of Carlton was not ideal for providing superfast broadband to all houses in Carlton (especially at the furthest locations from Carlton Green Road). It was believed that this location was chosen because it is an existing telephone distribution point and is convenient for power. BT will re-evaluate the location in June, looking at whether a more central position is possible, before making the final decision. The Councillors asked about the future upgrade-ability of the cabinet - the new cabinet would be fully capable of supporting future faster technologies such as G.Fast. However BT suggested that the roll-out of G.Fast would be similar to the roll out of super-fast broadband (i.e. Carlton would likely be last!). When the new super-fast broadband is enabled, it was pointed out the speed upgrade won't automatically happen. People will have to apply to be upgraded through their ISP to see the faster speeds. There will be a small time when the phone network will be turned off for the switch over to happen. This is normally only a few hours. BT Openreach inform all ISPs of the down time, and it is up to the ISPs to contact their customers to inform them. If the parish council finds out when this is going to occur then we will send out an update. With regards to which ISPs will offer connections to the new cabinet, normally most ISPs would offer a connection, sometimes after a slight delay. Maps can be calculated for other possible cabinet locations. Note that a similar map for Carlton Green has not been produced as we don't yet know the proposed location of their green cabinet, plus given the relative compactness of Carlton Green almost certainly all houses there would receive close to the maximum bandwidth assuming their green cabinet was located within Carlton Green. Three of the Carlton Parish councillors will be meeting our new MP on Friday 23rd October to discuss the issue of getting faster broadband for the village. I know that many of you have been concerned about the Super-fast Broadband situation with regard to our area. You may also be aware that the parish council have been lobbying to ensure that we are included in the scheme and that we are able to receive appropriate levels of supply into our community. At present, our supply originates from the green box located close to West Wratting Crossroads. The distance from our village would have meant that it was unlikely that we could have obtained any significant improvement to what we get at present. The predicted time frame for our community's supply has been correspondingly put back on a couple of occasions whilst Connecting Cambridgeshire have been in consultation with BT to come up with a solution. Hence, please note the information which I received from Connecting Cambridgeshire below. This is good news insofar that they are providing the cabling/supply to our village, but also frustrating that the time frame has again been put back until the end of 2016. If, as intimated in the email, there any positive changes to this time frame, then I will of course let you know as soon as I have this information. As promised in our previous email (below), we are pleased to be able to update you about planning for broadband provision in your area under the Connecting Cambridgeshire programme. Following our request for BT to investigate solutions to provide the best possible connectivity for the harder to reach areas such as yours, we have just received the results of the re-planning process. BT has confirmed that Carlton will receive fibre broadband by the end of next year (2016), however we will continue to press for delivery to be as soon as possible. 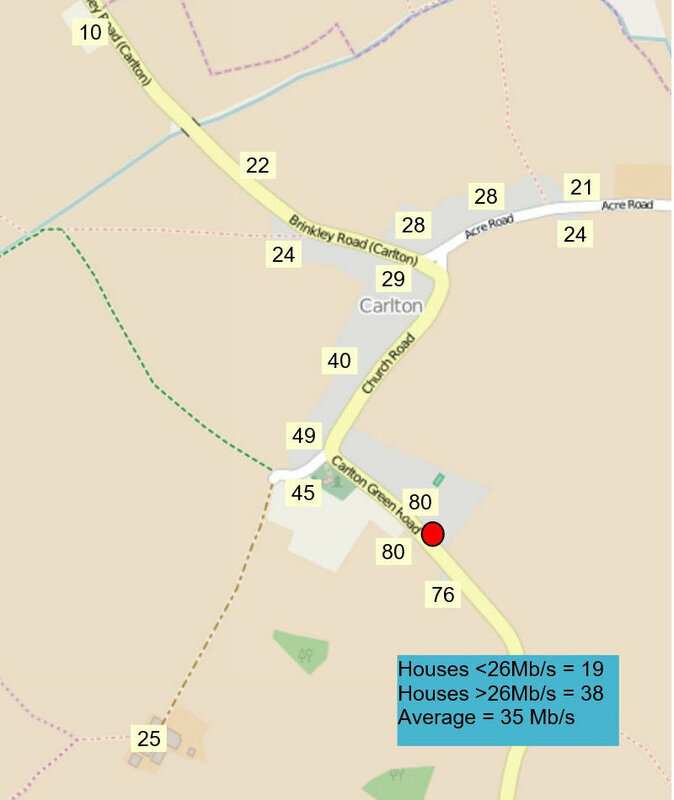 The proposal is to install a new fibre broadband cabinet however the location is subject to survey. However, BT have indicated that the new fibre cabinet will be on Carlton Green Road. We will continue to press BT to deliver this as soon as possible for your area, however we hope that this firm commitment will reassure residents that high speed fibre broadband is on the way. The Carlton ‘my area’ pages on the Connecting Cambridgeshire website have been updated with the new timescale and we will add further details when we are able. We hope you can help us to inform local residents, who are awaiting connectivity, of this positive news. This page was last modified on 9 January 2017, at 02:34.